We’re giving away THREE pairs (2 tickets each) of tickets to the Willie Nelson & Family concert at Marymoor Park on Saturday evening, 7/23. 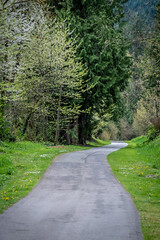 What’s one King County park or trail that you “can’t wait to get on the road again” to see? Here’s a list of our parks for some inspiration. ****King County Parks is NOT Seattle Parks. Post your answer on our Facebook or Twitter. Make sure you follow us on twitter and/or like us on Facebook so we can PM/ DM you with details if you’re the lucky winner. Contest closes at 10 a.m. tomorrow morning, 7/22. Winners will be notified via the social media platform you posted on. Entrants must follow the guidelines above to be eligible. King County Parks employees are not eligible. One entry per person (if entry is posted on both social media platforms, entrant name is entered only once). Any entries using offensive language, racism or discrimination will be removed and excluded from the contest at our discretion. By participating, entrants agree to give King County permission to use their photo and/or name for promotional purposes (example: your photo and first name on our website). Ticket give-away winner will pick up their tickets at the Concert Box Office at Marymoor Park. Parking and concessions not included. Entrants must agree to all of the above terms to be eligible. Previous Post I <3 KC Parks because…….